Forced to look elsewhere for a kit supplier after the collapse of Bukta just weeks into the second year of their two year deal, United eventually turned to another British manufacturer, Wolverhampton based Loki. Taking over in October 1992, the entire strip was kept as close as possible to the Bukta design for continuation purposes. The Club’s crest was again embossed throughout the material of the top, and the thick black strip with white trim ran the full length of the sleeve on each side just as before. The collar was also similar, but now had a longer, more standard looking black placket with two large buttons. 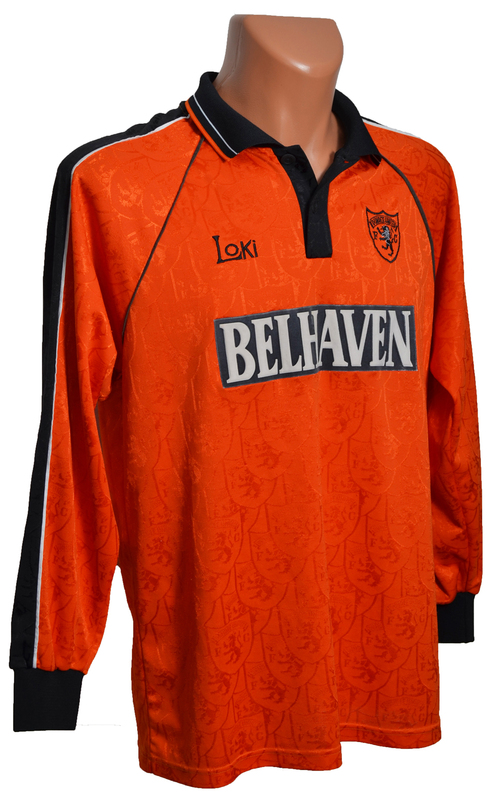 The Loki Home top made its playing debut in the 1-1 draw Away to Falkirk on 24th October 1992. United finished in 4th place in the Premier Division for the fifth consecutive year, and had little progress in either Cup competition. However, the emergence of Duncan Ferguson was a highlight during this time, before his record breaking £4 million transfer to Rangers, and in 1992/93 United also qualified for Europe once more, after missing out for the past two seasons. This would turn out to be Jim McLean's last season as manager, after he decided to step aside after over 20 years in the job to concentrate on his role as Club Chairman.